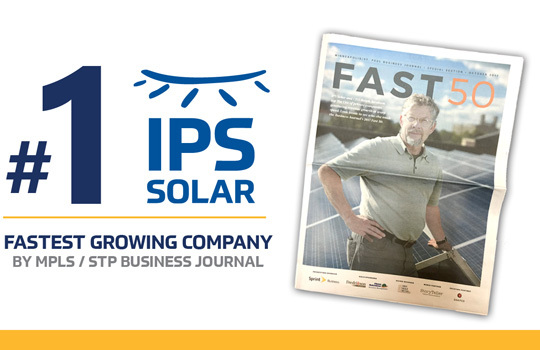 Coming in at #1 of the Fastest Growing Private Companies is… IPS Solar! We’re very grateful to our internal team and our customers who made this a possibility. The benefits of solar are becoming more and more evident and in today’s global community, are becoming more and more vital. “The two biggest challenges for us are the dynamic cash flow requirements for our projects, and finding and retaining talent. Solar is a very fast-growing industry and almost no one has relevant experience. We’ve been blessed to hire people with a ton of passion. It’s easy to train team members who are motivated. – IPS Solar CEO Ralph Jacobson on his views about the company’s growth and future opportunities. This entry was posted in IPS Solar, Solar Industry on October 23, 2017 by Kyle Wehnes.